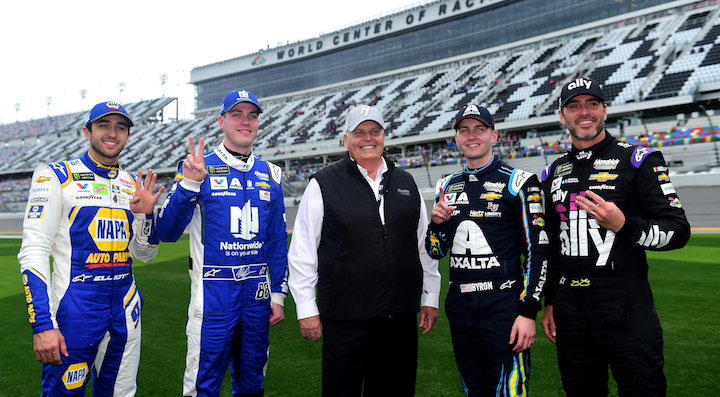 Jeff Gordon fans will be greeted with a pleasant site when the starting grid lines up for the 2019 Daytona 500, with the No. 24 Chevrolet Camaro ZL1 of William Byron set to start the great American race from pole position. Byron blitzed the competition to pole position during Sunday’s Monster Energy NASCAR Cup Series qualifying at Daytona International Speedway, turning in a 194.305 mph lap (46.319 seconds) and edging out the No. 88 Chevrolet of Alex Bowman, which will start second on the grid. Bowman’s 194.154 mph lap was enough to relegate the No. 48 Chevrolet of Jimmie Johnson to third. Yet another Chevrolet, the No. 9 of Chase Elliott, was fourth – completing a lockout of the two front rows for Chevy. Additionally, the No. 8 Chevrolet of Daniel Hemric was fifth, while reigning Cup champ and No. 22 Ford driver Joey Logano was sixth. Completing the top 10 was Toyota driver Martin Truex Jr. in seventh, Clint Bowyer in eighth, Brad Keselowski ninth and 2018 Daytona 500 winner Austin Dillon tenth. Only Byron’s and Bowman’s starting positions are locked in, however, with the Gander RV Daytona Duel qualifying races deciding the remainder of the starting order. The qualifying races are scheduled for Thursday evening. Byron is hoping he and his new crew chief Chad Knaus can convert his qualifying success into a wain come Sunday and is happy to have the weight of the qualifying races off his back. The 2019 Daytona 500 will go green on Sunday, February 17th at 2:30 pm ET. The first of the Duels is scheduled for Thursday, February 14th at 7:00 p.m. ET. This happened Sunday. A little late with the update, no? Hope a Chevy wins this one in a laugher. Hopefully the redesign of the Camaro will make them competitive this season. Obviously, the Ford teams found something last year, cuz they were eating everyones lunch. Sure hope that means 2019 will not be a repeat of 2018. Win Daytona and don’t stop there go on and dominate the rest of the season. ZL1 Start first and see the checkered flag 1st !! !